Pupils and teachers from 1,200 schools have taken part in the First World War Centenary Battlefield Tours programme so far. They have visited key battlefield sites on the Western Front, walked through trenches, crossed No Man’s Land, fallen silent at the sight of the thousands of graves, and had the chance to handle a host of original artefacts, from pieces of shrapnel to the bulky wool serge great coats worn by soldiers in the 1914 to 18 war. The aim of the government-funded programme is to enable teenagers to develop a deeper understanding of the First World War, its scale and the millions of lives lost. The scheme will run until the spring of 2019, enabling two pupils and one teacher from 4,000 secondary schools in England to visit the battlefields of northern France and Belgium. But the programme is far more wide-reaching than the visits themselves. On their return to school, students embark on a Legacy 110 project, sharing their experiences with their local communities and helping to create a lasting legacy for the First World War Centenary. The idea behind Legacy 110 is that every student who has been on a battlefields tour should pass on what they have learned to at least 110 people. If they all meet this target then 880,000 people will be reached – representing the number of British and Commonwealth soldiers who died during the war. Schools across the country have come up with an impressive array of Legacy 110 projects, from studying the role played by women during the First World War to looking at the contribution of Commonwealth forces. In November, pupils from four schools whose projects stood out were invited to the House of Lords to meet communities minister Baroness Williams. They showcased their projects and spoke about the impact on their local communities. The students included Ethan and Abean, two year 10 pupils at St Paul’s Catholic High School in Evington, Leicestershire. 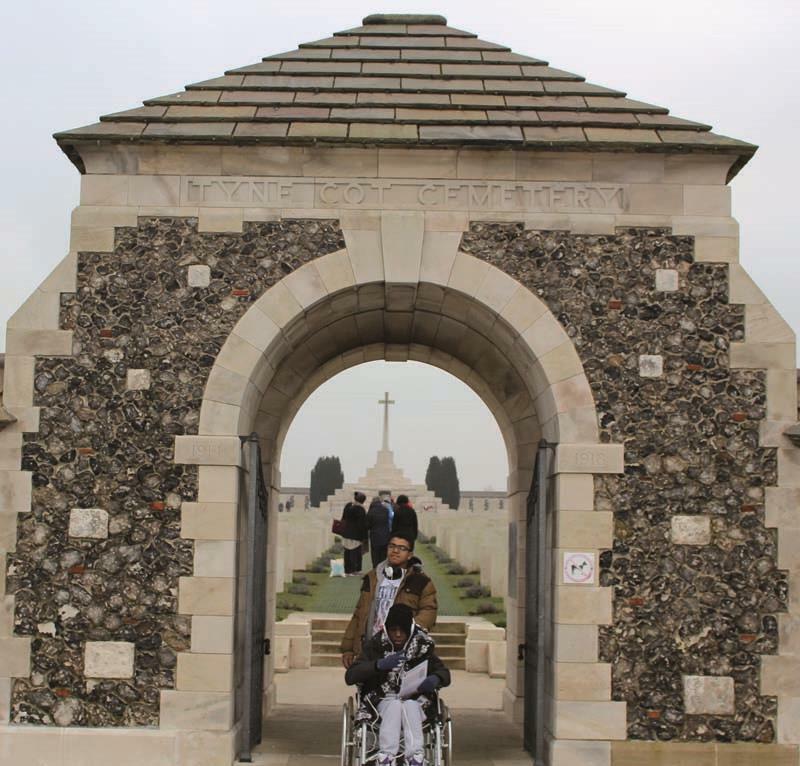 Before visiting the battlefields in September 2014, Ethan and Abean had researched the names of soldiers on their local war memorial and found that two were commemorated at sites they were due to visit – Archibald Bowell at the Thiepval Memorial in France and Gerald Trolove at the Memorial to the Missing at the Menin Gate in Ypres in Belgium. On their return, the boys talked about their experiences with their class, school and the village of Evington. Their research is being shared with neighbouring primary and secondary schools and has also been placed in a time capsule at the village’s war memorial. “We wanted to record our visit, what we had seen and what we had done and then come back and tell the people in our village why it is important that the sacrifice made by the likes of Archibald and Gerald is never forgotten,” explained Ethan. Next to talk about their Legacy 110 project were Jack and Brandon, who are both in year 9 at The Meadows School, a special school for 11 to 19-year-olds in Leek, Staffordshire. They visited the Western Front in September 2015 with deputy head Joan Wright and teacher Jane Ball and were chosen to lay a wreath during the nightly Last Post ceremony at the Menin Gate. Before the trip, Jack and Brandon had researched the lives of two local footballers – Joseph (Sammy) Arthur Hulme, a trainer for Leek Alexandra, and Leigh Roose, a goalkeeper for Stoke City. Both men were killed in 1916 and had no known grave. 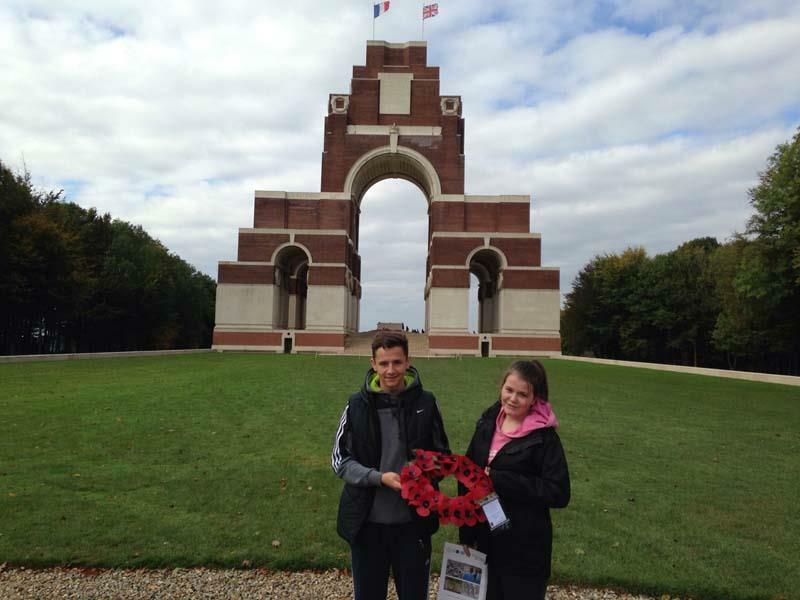 During their battlefields tour the boys found the names of the two men on the Thiepval Memorial and placed wreaths, poppies and tributes in their memory. Back home the teachers and pupils launched a range of initiatives. Two local schools and members of the Royal British Legion joined The Meadows for a service of remembrance on Armistice Day and students released 50 red balloons, each with a label bearing the name of a soldier honoured on Leek’s war memorial. Jack and Brandon’s research was also highlighted by BBC Radio Stoke and mentioned in Stoke City and Leek Town’s match day programmes. Meanwhile, pupils at Cardinal Newman Catholic School in Coventry formed a Peace and Justice Group following their battlefields tour in September 2014. After much discussion they decided to design and build a quiet, contemplative garden where pupils, staff and members of the local community could sit and reflect. The school’s Peace Prayer Garden was duly opened on November 11 last year by two Second World War veterans, honouring the memory of the fallen from all conflicts as well as “individuals connected to the school who have sadly passed away”. One of the most inspiring legacy projects of all was created by Jhonattan and Zach from Vale School, a special school in Haringey, north London. 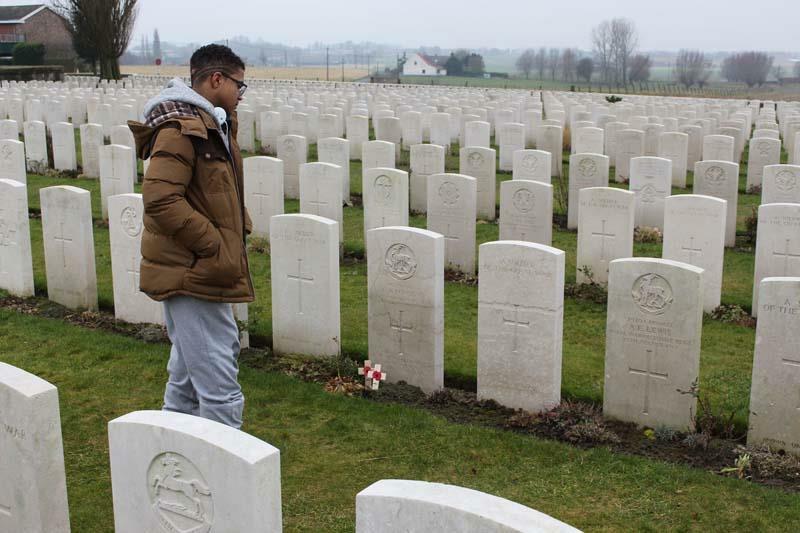 Inspired by the idea that “every headstone tells a story”, deputy head Tony Millard asked the boys to focus on a soldier called George Baxter Lowson, who lived in nearby Tottenham and who died in the Ypres Salient in 1917. He is buried at Tyne Cot Cemetery. 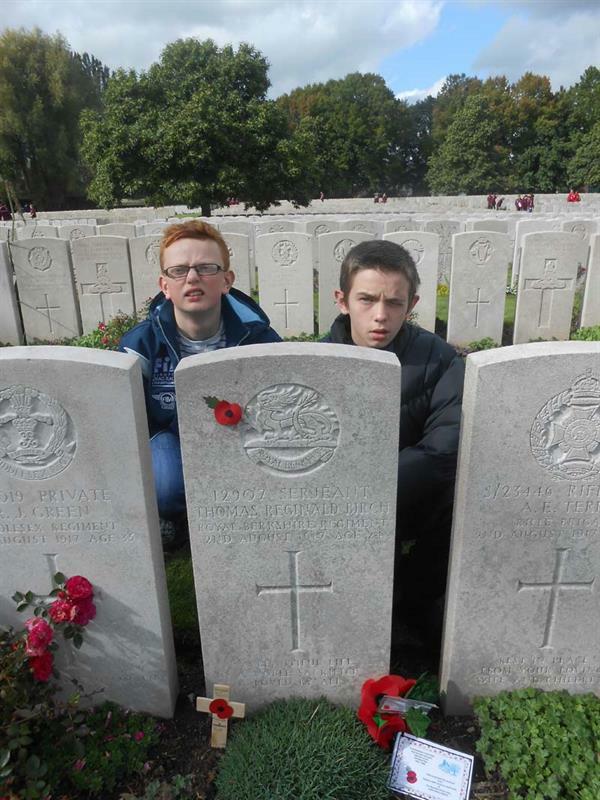 “We were really emotional when we found his grave,” said Jhonattan and Zach, who are in year 11 and 12 respectively. Mr Millard, who also teaches music at the school, recorded the boys’ thoughts and feelings during the tour. On their return he and the boys collated their ideas, made them into lyrics and came up with the melody. I came across this article this morning after hearing on the news that relatives of those who fought at Passchendaele are being sought. Your report was so interesting - the description of the young students from St Paul's school in Evington particularly caught my attention because of their connection with one of the men from their village, Archibald Bowell. He was a distant relative of mine (the Bowell family were originally from Oxfordshire) and although I have researched his background, been to Evington and knew how he died I have never been inside the church where he lived. How good it is to know that today's young people are still being taught the relevance of a war of a hundred years ago. I am now going to listen to 'My Mate George'! Thank you.